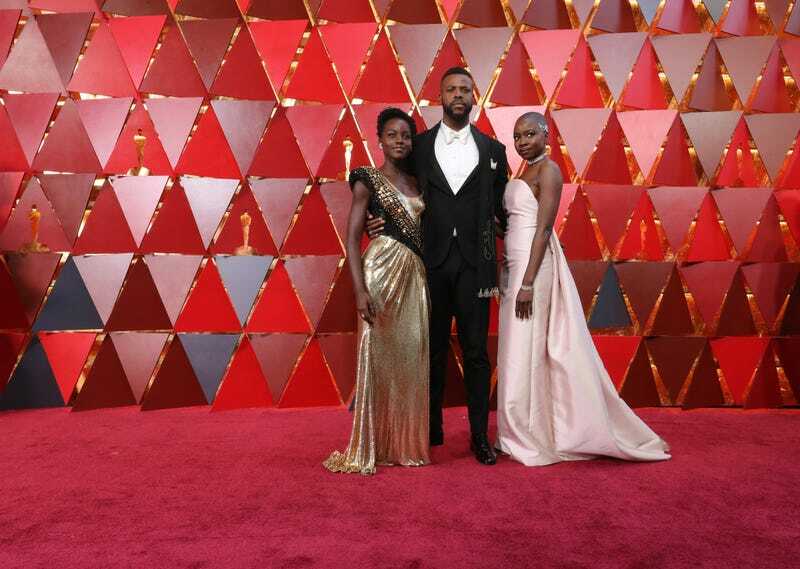 Lupita Nyong’o, Winston Duke and Danai Gurira dazzle at the 90th Academy Awards ceremony. While there were no big upsets like last year’s last-minute turnover of the award for best picture, the Oscars also weren’t so white this year, as proved by the red carpet of the 90th Academy Awards Sunday night in Hollywood, Calif. Indeed, we made history Sunday night: Mary J. Blige was the first person in Oscars history to be nominated for both an acting award and for best original song for the same film (and performed!). Jordan Peele became the first black person to score a win for best original screenplay. And in a surprise plot twist, Kobe Bryant is now also the first NBA player to score an Oscar win. And while we still have a long way to go in terms of representation (and after the success of Black Panther, we are anxious to see what next year’s Oscars might bring), this year’s ceremony was nevertheless filled with refreshing moments. Our favorite? Seeing Janet Mock, Patrisse Kahn-Cullors and Tarana Burke in the spotlight among an array of activists featured in Common and Andra Day’s performance of their nominated song, “Stand Up for Something,” from Marshall. But, of course, the evening didn’t end there. One of the best parts of Oscar night is the über-exclusive annual Vanity Fair after-party, and our folks were out in force, giving us a bonus round of big fashion moments (minus one blue vest that felt a bit out of place amid all that glamour—#SorryNotSorry). Maybe a different kind of red-carpet blackout?